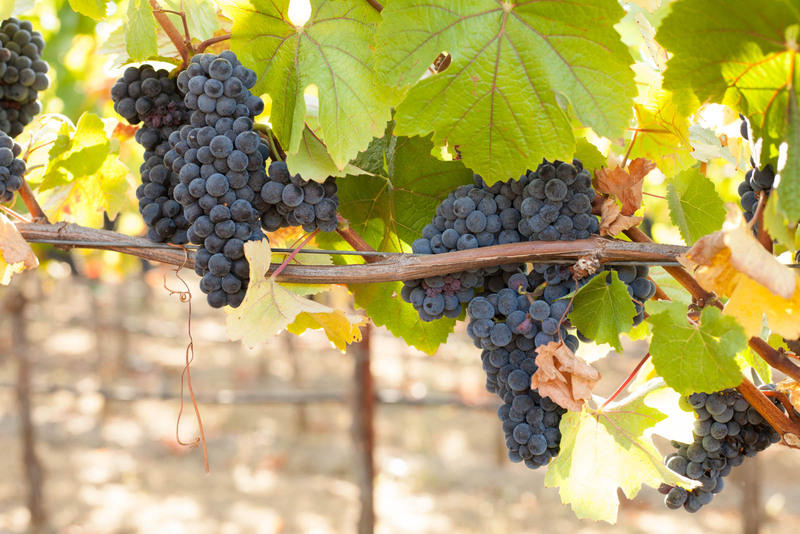 Part 2: Is Russian River Pinot Noir as Californian as Pinot Gets? On a hot August day, Ben McWilliams drove us around his 36-acre Russian River estate in a four-person golf cart. He was still dressed in a ballcap, T-shirt and jeans from working amongst the vines, and I thought, this juxtaposition was the perfect symbol of the Sonoma wine country experience: At it’s heart, it is still very much a farming community. Always has been, always will be. But the people who come here looking to drink its luxurious wines? Well, they probably expect to hitch a ride in a golf cart from time to time. From the get-go, I liked Ben’s easy-going style. As we went in and out of the shadows of oak trees, he seemed free of any pressing issues despite the upcoming harvest. It was simply good to be outside. 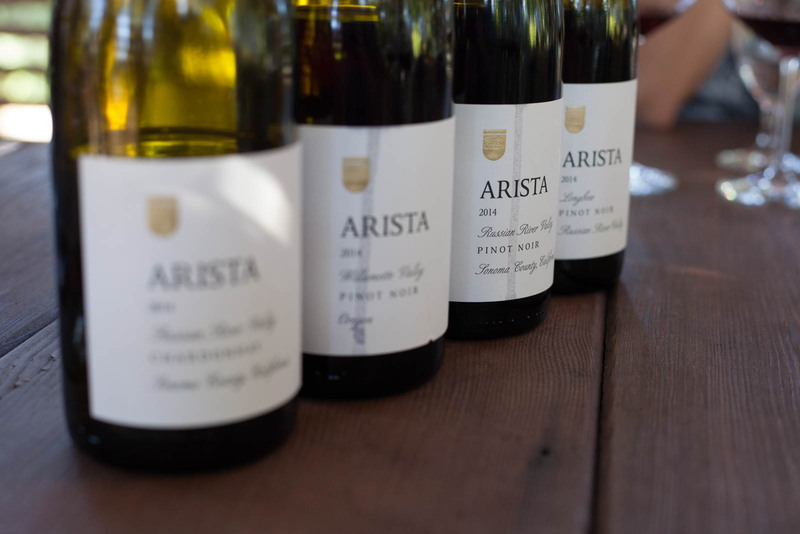 Along with his brother, Mark, Ben has been running Arista Winery for four years, which their father started in 2002. For me, it seemed like a great place to dive a little deeper into Russian River Pinot Noir, and see the vines and grapes up close. It’s a refrain you hear a lot from winemakers: great wine is made in the vineyard, not in the winery. 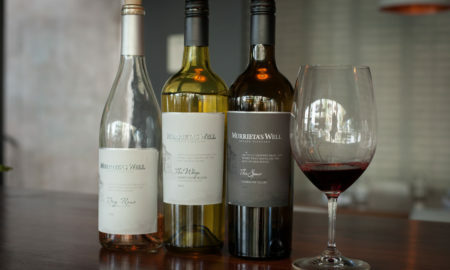 But behind Ben’s comment was a subtle suggestion that while trends come and go, what he and his family were doing with Arista’s wines will endure. After all, he was just working with what nature was dealing him — and nature knows a thing or two about being timeless. But let’s be clear: Russian River Pinot Noir is not out of fashion. 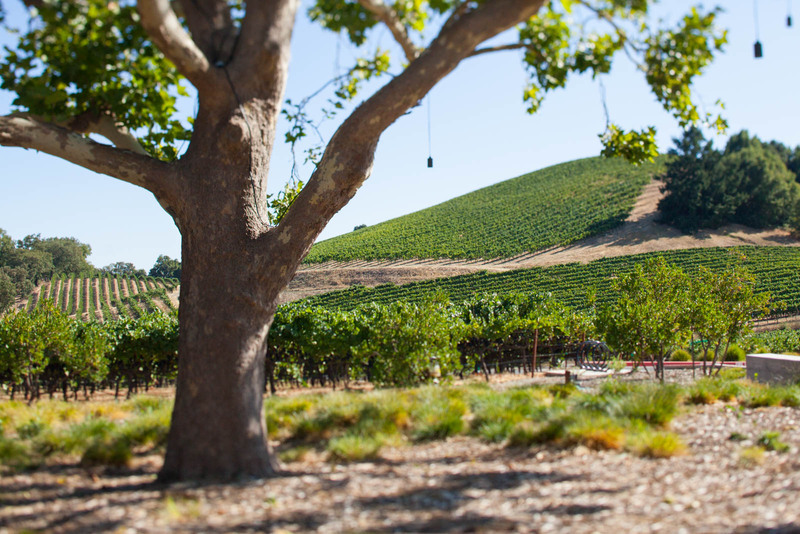 Far from it, as it remains one of the top-selling Pinot Noir wine regions in America. Nor is it panned by critics and sommeliers. 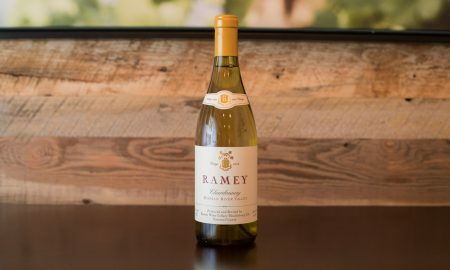 It’s just that other places — specifically the West Sonoma Coast — are having their moment in the spotlight right now, and one could argue that the reason they are is because they recall the grape’s roots in Burgundy more than the flamboyance of the New World. Put another, more cynical way, they are being praised at the moment for being the antithesis of the Russian River style. 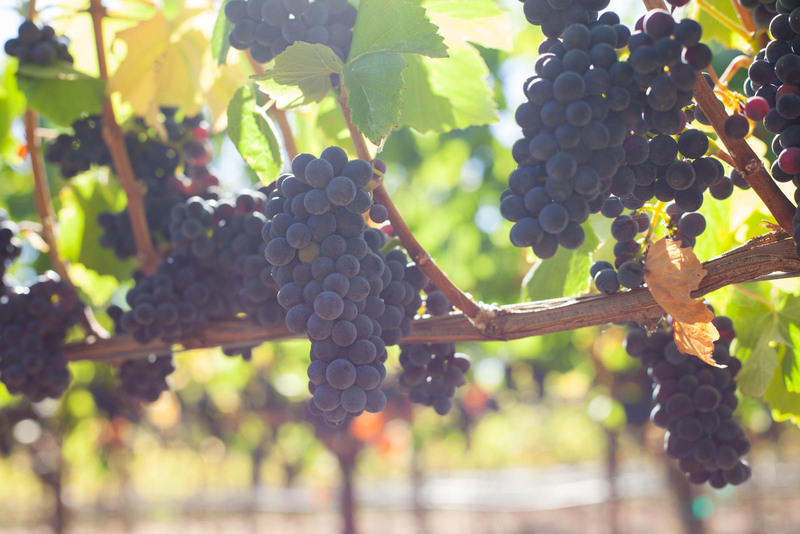 That’s because Pinot Noir from here tends to be broader and more expansive on the palate. It will carry a longer finish, and sometimes take a few more years to fully mature in bottle. 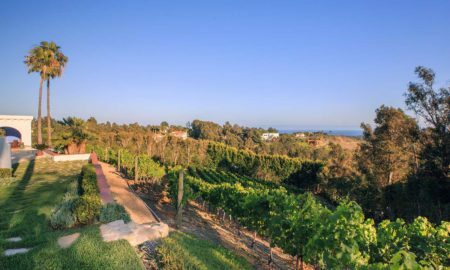 But these wines are distinctly Californian in their personality; you can detect a bit of hedonism and spontaneity in their silky plushness. 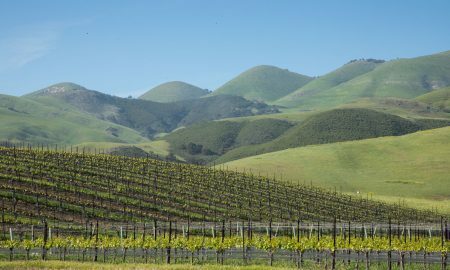 As with any American Viticultural Area (or AVA), the Russian River Valley has a lot of variety, with more than 100 wineries stretching across a vast area that includes redwood forests, oak-draped hills and flat bottom-land. All told, 16,000 acres is under vine in the area, with the winding Russian River as the one unifying factor. Drawing conclusions on the area as a whole is impossible, let alone based on one winemaker’s wine. (But I was certainly willing to try). One conclusion that seemed obvious, based on the sweat on my brow, is that this is definitely not a cool climate territory, especially in the so-called “Middle Reach” of the valley near Healdsburg where such wineries as MacRostie, Hop Kiln, Twomey, Williams Selyem and Arista are located. 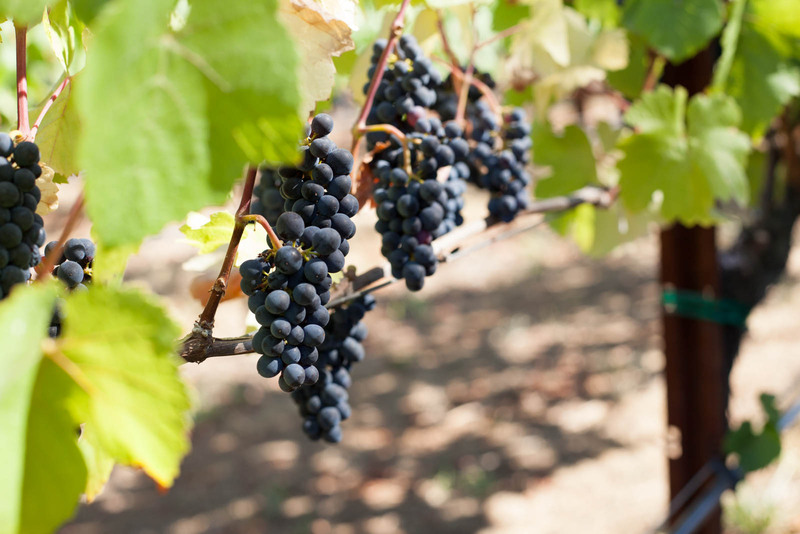 As we surveyed clusters in the direct sun, I was honestly surprised that the area is even hospitable to Pinot Noir, based on what I have always read and researched about this notoriously sensitive grape. But then the next day, my wife and I would learn why in a canoe. After leisurely paddling for three hours down the river from Burke’s Canoe Trips, we were suddenly blasted by a wicked headwind that stalled our progress. 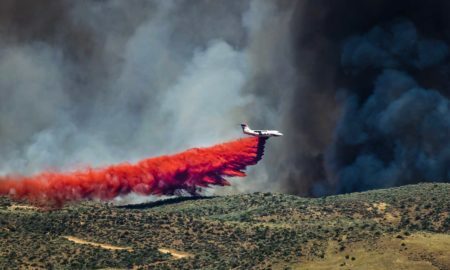 It was noticeably laced with moist, Pacific Ocean air, and the presence of such afternoon winds keeps the clusters dry and rot-free. Occasional tongues of fog also travel up valley, which — combined with cool nights — help to lock in the needed acidity that keeps everything in balance. The warmth during the day creates a deep-level of ripeness within the berries, resulting in a wine that has an identity founded on richness, depth and length. 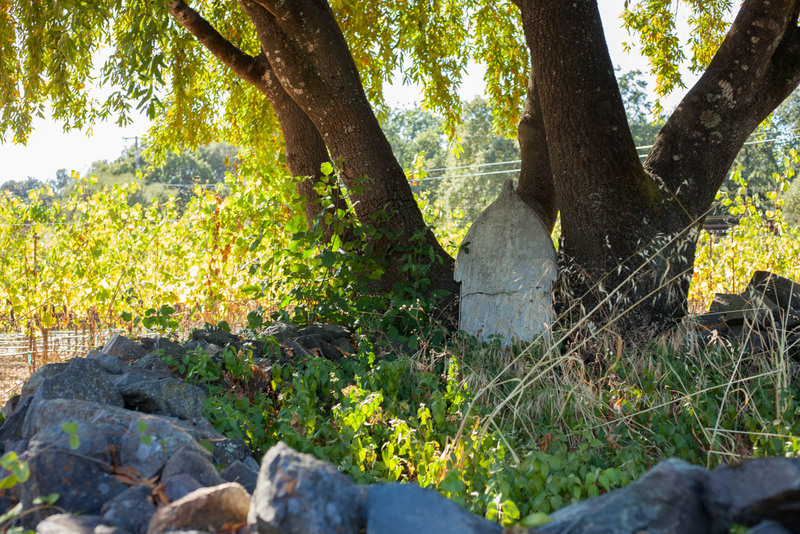 Between the tasting room and Westside Road, on an angled pitch of ancient river-bed soil with a graceful bay laurel tree at its center, Ben showed us the Harper’s Rest Vineyard. The vineyard takes its name from Ruben Harper, a hops farmer who previously owned the land in the mid-1800s. After his death in 1857, the land lay fallow for 149 years until the McWilliams family began developing a vineyard on the plot. “And there’s Ruben,” Ben noted, pointing to an old headstone under the tree. Arista makes an estate wine from the plot called Harper’s Rest (but unfortunately for Hailey and I, they were all out of the latest vintage). 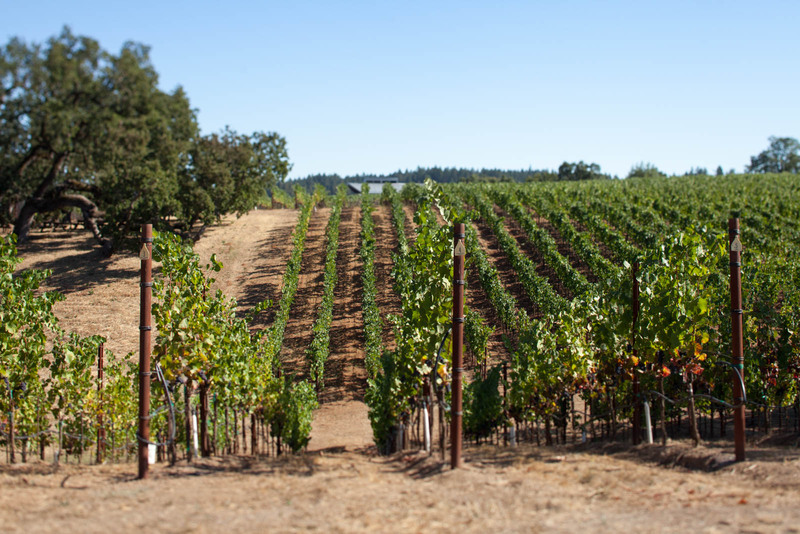 Further up the hill lay the Seven Stories Vineyard, where Ben, Mark and winemaker Matt Courtney are experimenting with different clippings from around the Sonoma Coast and Russian River Valleys. “It’s like our one-acre laboratory. 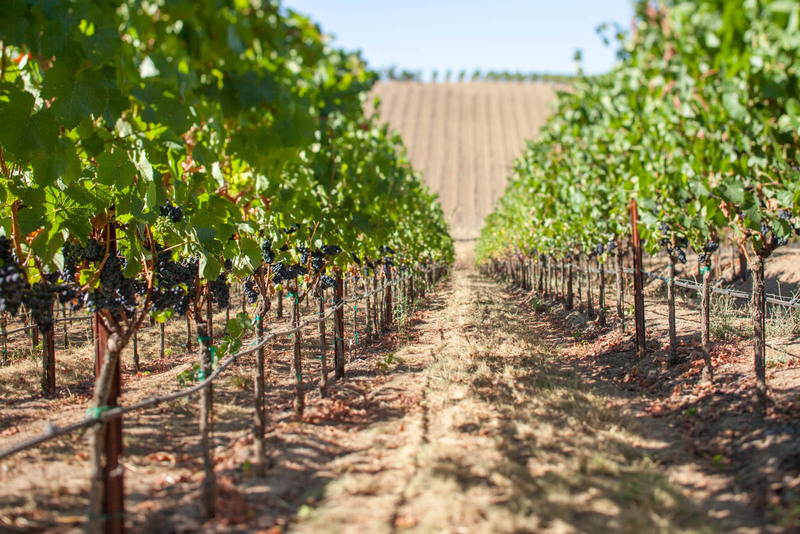 But ultimately, we use the grapes from here as a blending component.” Each of the four estate plots (Harper’s Rest, Seven Stories, Two Birds and Bee Tree) were propagated from vineyards around Sonoma County that they felt demonstrated the best potential. But given time, the vines will likely become more and more Russian River in character. Shortly after that, we stopped to pick plums from the estate’s garden and enjoy them with the hilltop view of Mount St. Helena and the Mayacama Mountains in the distance. Again, Ben seemed to have nowhere else to be. The plums were ripe, their juice turning to syrup instantly in the heat. We needed a napkin, and something to drink. So we headed to the patio below the tasting room, where Ben poured Arista’s whole-cluster fermented Chardonnay as well as three Pinot Noir. 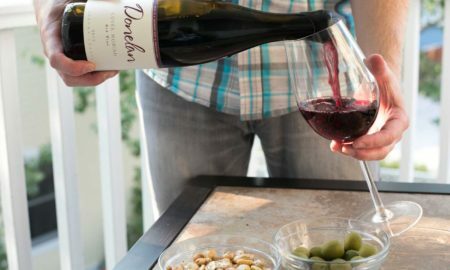 Strangely, the first Pinot Noir was actually from Oregon — a 2014 vintage which they’d made from purchased grapes. And having sampled several Oregon wines from that hot vintage, it was one of the better ones, too. 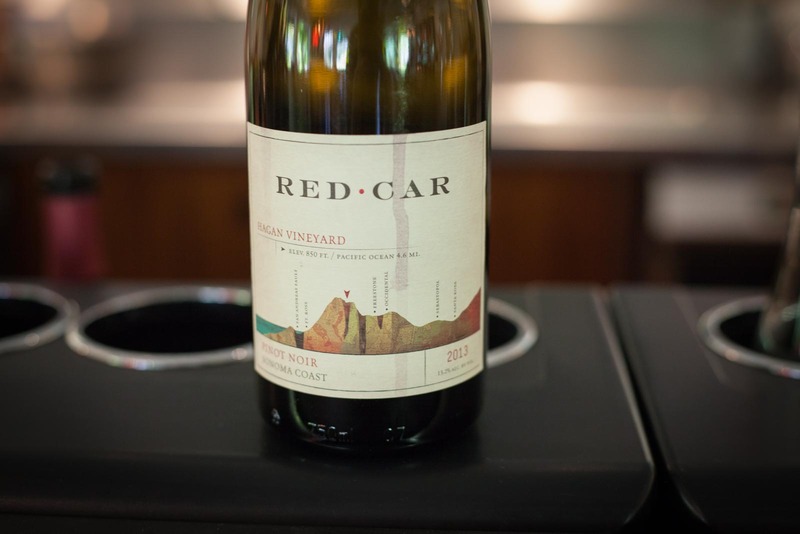 Ben commented that the 2014 vintage was a good one in Oregon, which seemed to further underscore the separation of camps in the world of Pinot Noir. 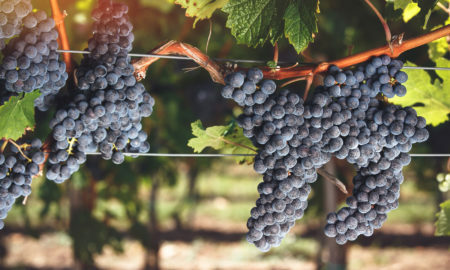 If you prefer your Pinot to be high in acidity, precisely detailed and aromatic like a bouquet of flowers, than 2014 was certainly not a great year in Oregon. During our visit earlier this summer, I found it to be all-over-the-place, with some locales producing downright flabby and saccharine juice. Other places, such as Raptor Ridge in the Chehalem Mountains, produced excellent wine in 2014. But it wasn’t quite in the “razor’s edge camp” for acid lovers. Ben’s version was really fun. It’s layers of fruit were all berries and cherries, and it compelled me to want more because — while the texture was plush — it was broad on the palate with playful edges. In other words, it was like a Russian River Pinot Noir. Ben also served a blend from the estate plots we had just toured, which demonstrated a similar stride: texturally silky, broad and expansive length, and elegant edges that carried quite a bit of detail. The difference between it and the Willamette Valley Pinot Noir was a bit more decadence in the fruit. I preferred it. Then, he poured the final and best of his wines, the 2014 Arista Longbow Pinot Noir (★★★★ 1/4). 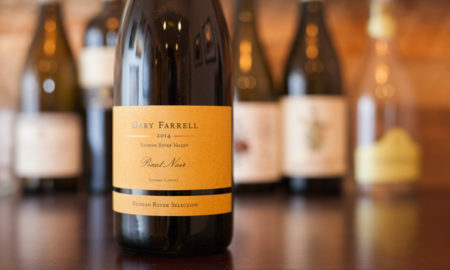 Made from a selection of his best grapes from around the Russian River Valley AVA, it demonstrated how singular and wonderful a bold and expansive Pinot Noir can be. Certainly, there was a depth in the black-cherry like fruit that painted the palate with broad brush strokes — clearly a hallmark of the area — but also a lot of detail in the nose: some notes recalled baking spice, others recalled earth and musk. It was also a little wild, giving it a bit of thrill with each sip. We wrapped up our first day in Sonoma and already, it was an education. We’d tasted two very different stylistic approaches to Pinot Noir: one, from Carneros, was restrained and detailed and precise (i.e. cool climate). The other, was rich and opulent with an expansive horizon and a sense of adventure (i.e. warm climate). Put in those words, one sounds more Californian to me. Next up for us, was a taste of the West Sonoma Coast — the very place that all of the somms and critics are crazy about at the moment. Wells Guthrie’s Copain Wines had been popping up in front of me at wine shops, wine lists, wine events and wine articles for years. The word was always positive: “This guy gets it,” one wine shop owner had told me. 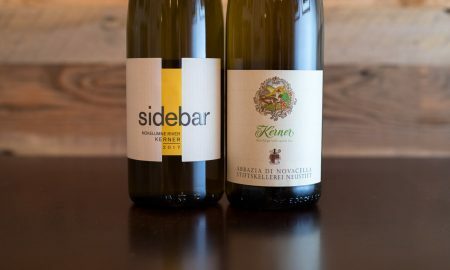 “He has an Old World style with New World terroir … his wines are very food-friendly.” Read more.